phpBB by default automatically subscribes the new user to receive boards emails upon registration. 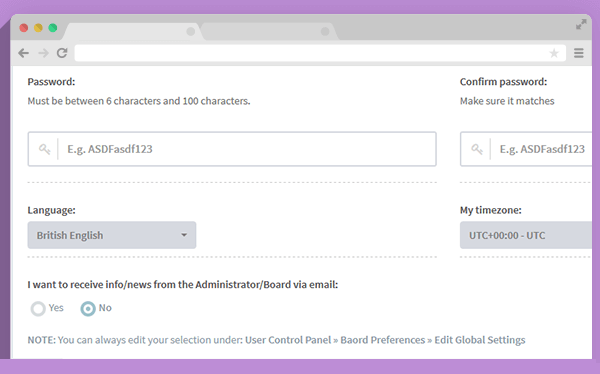 This extension allows users to choose whether subscribe or not to the admin news/board emails during registration process. The subscription is disabled by default now. Will this stop forgotten password emails etc? Nope that's really basic stuff user should not be opted out. Same for the activation of a new account if the board requires it. For example if you send a mass email via ACP and the user opted out he will not receive that email. Where do I go in ACP to change the default to YES? If your website has european members, regarding gdpr you can't have by default at Yes. Since the user stricly needs to choose the yes. I beleive you can only change by changing an html file. Thanks, I didn't realize GDPR had that rule. Can it be set to no selection and require the user to pick one? I'm concerned users are skipping over this question since something is already picked.